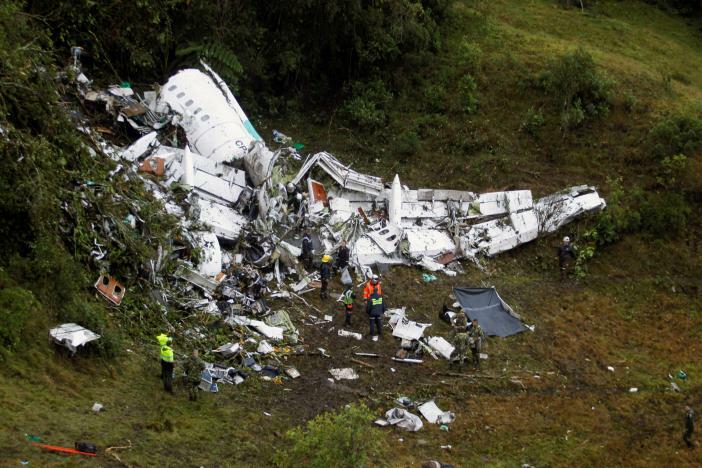 A charter plane carrying Brazilian soccer team Chapecoense to the biggest game in its history crashed in the Colombian mountains after an electrical fault, killing 75 people on board, authorities said on today. Colombia's worst air disaster in two decades killed all but three players on the up-and-coming team from Brazil's top soccer league as it flew to face Atletico Nacional of Medellin in the first leg of the Copa Sudamericana final, South America's equivalent of the Europa League. The plane was shattered against a mountainside with the tail end virtually disintegrated. 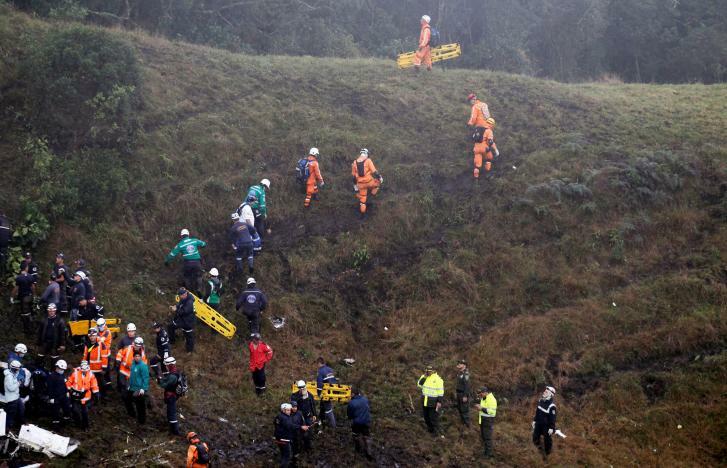 Rain hampered dozens of rescuers as they combed the muddy and forested area. Colombia's civil aviation authority said there were 75 confirmed fatalities. 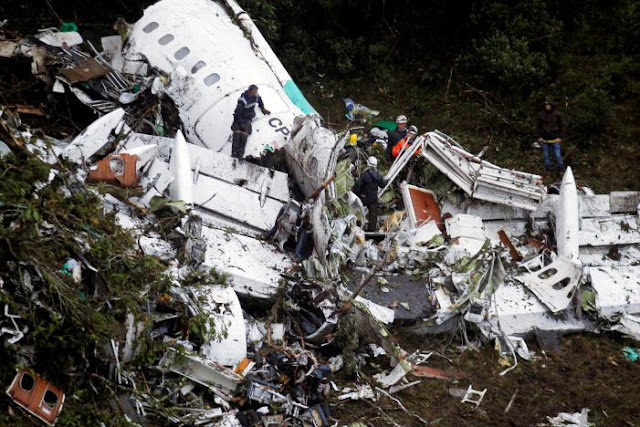 It identified the six survivors as players Alan Ruschel, Jackson Follmann and Hélio Neto; journalist Rafael Valmorbida; Bolivian flight attendant Ximena Suarez; and Bolivian flight technician Erwin Tumiri. Neto and Valmorbida were in "very delicate but stable" condition in intensive care, Dr. Guillermo Molina, head of a clinic treating them, told Reuters. Neto suffered trauma to his head, thorax and lungs, as well as open wounds to his knees. Ruschel also was in intensive care but in stable condition, Dr. Ana Maria Gonzalez, director of another clinic also attending them, told Reuters. The two members of the flight staff were out of danger and under observation, she said. It was the first time Chapecoense, a small club from the southern Brazilian town of Chapeco, had reached the final of a major South American club competition. Matches were canceled around South America and Brazil declared three days of mourning. 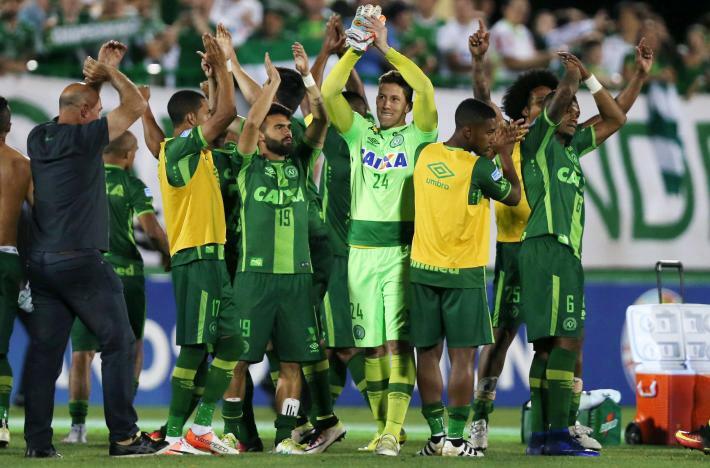 Atletico Nacional asked for Chapecoense to be awarded the trophy in honor of those who died. "They were the hope of our city," said Jean Panegalli, 17, a student in Chapeco, where fans were disconsolate. "They played for love of the shirt and not for money. They played with the commitment that only those who have lived here know." The team took a regular flight to Santa Cruz in Bolivia and then went from there to Medellin on the plane run by a Bolivian-based company called LAMIA with roots in Venezuela. By early afternoon, rescuers had recovered 72 bodies, which were to be flown out by helicopter for identification and then repatriation. World governing body FIFA said on Twitter its "thoughts were with the victims, their families, fans of Chapecoense and media organizations in Brazil on this tragic day." Chapecoense qualified for the biggest game in its history after overcoming the Argentine club San Lorenzo in the semi-final on away goals following a 1-1 draw in Buenos Aires and 0-0 draw at home. Chapecoense was the 21st biggest club in Brazil in terms of revenue in 2015, bringing in 46 million reais ($13.5 million), according to a list by Brazilian bank Itau BBA.